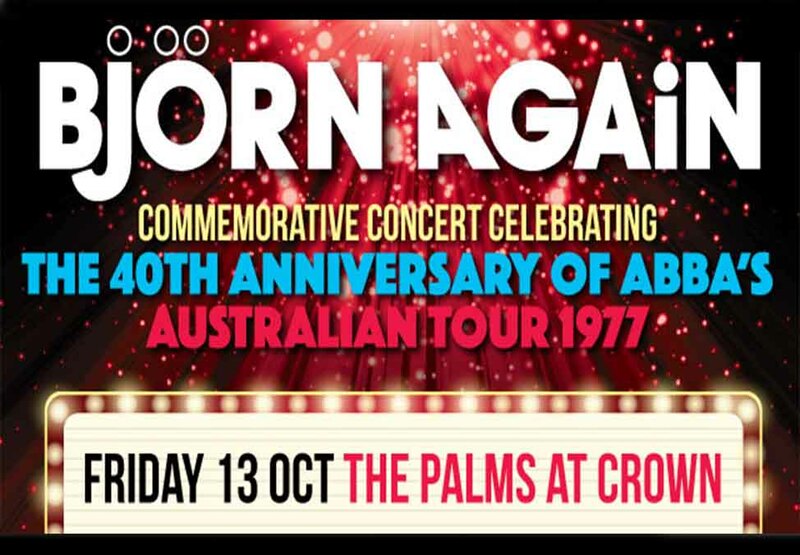 BJORN AGAIN will be performing a special commemorative concert celebrating 40 years since ABBA toured Australia. This year marks the 40th Anniversary of ABBA’s first and only tour of Australia which took place over 2 weeks in March 1977, playing 11 shows in Sydney, Melbourne, Adelaide and Perth to over 160,000 people. ABBA’s travelling entourage was a massive 117 people which included 34 musicians and singers. Tickets were $9.50 and $12.50, expensive at the time as most other concerts were around $5. During the tour they filmed footage which became ‘ABBA-THE MOVIE’. In Melbourne, ABBA performed 3 shows at The Sidney Myer Music Bowl – 2 on March 5th and 1 on March 6th 1977. Each show drew a capacity 14,000 people with a further 16,000 listening from the surrounding areas of King’s Domain. Prior to these shows, ABBA appeared on the Melbourne Town Hall balcony greeted by over 4,000 fans below in Swanston St. If you attended any of these concerts please get onto the Bjorn Again Facebook page at BjornAgainAustralia and tell everyone about it – we’d love to hear your stories! Melbourne’s own Björn Again – the most popular ABBA show in the world and fully endorsed by ABBA – are thrilled to commemorate the 40th Anniversary of these concerts with a special show at The Palms on Friday 13thOctober. Don’t miss it!